There were some 1,700 start-ups in the autonomous driving technology space in the last year, according to Vijay Rao, automotive and transport research director at the Sydney office of global consultancy Frost & Sullivan. These small companies are working to develop the essential ingredients — such as high-definition mapping, artificial intelligence, and sensors — that will make autonomous driving a commercial reality on highways and byways all over the world. The volume of activity by small players in the autonomous vehicle space together with OEMs (original equipment manufacturers) such as Tesla and Hyundai, tells us that autonomous driving in the future is inevitable, suggests Rao. 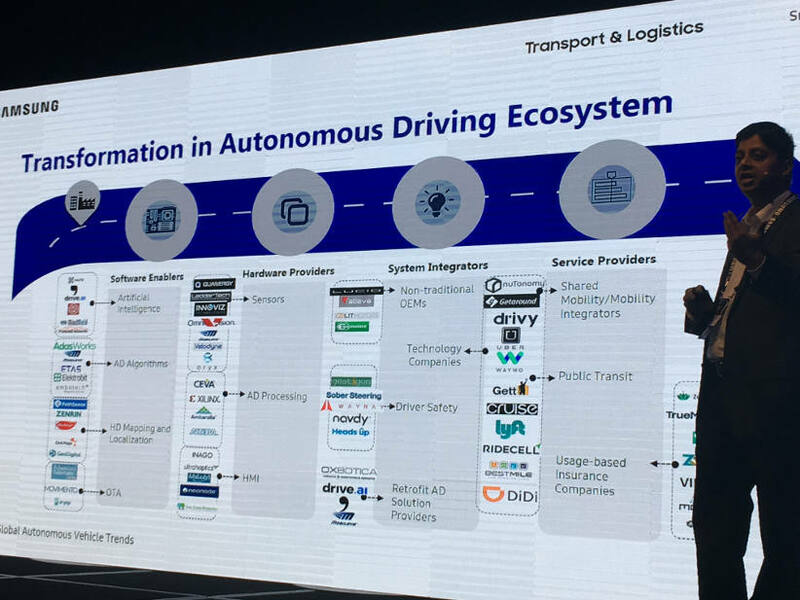 “We do have the certainty these trends are happening and that we are going to have an autonomous vehicles sector,” Rao told a Samsung transport and logistics summit in Melbourne in early September. The end goal for many of the companies working in this space is to remove the human as a driver from the car, and have them as a passenger. “We call this fully autonomous driving and we see it happening from 2030,” said Rao. Meanwhile, this year is already seeing major steps towards highly automated driving, such as reaching the so-called eyes-off stage where the vehicle’s auto pilot is capable of taking over. (I’ve experienced Tesla’s Model S doing this and I wasn’t freaked out). By 2021, vehicles will be fully automated and we will see what could be called hybrid driving, where human drivers are still required to keep their hands on the wheel because standards, legislation and insurance issues have yet to be settled. Finally, in 2030 the human will be just a passenger and the machine will have taken over human interference. To be sure, for this to come about, there are several key developments required. One is the supercharged 5G mobile data network that is critical to manage the speedy communication flow between vehicles. Another is the cost of technology, such as sensors, needs to be brought down. (A fully autonomous vehicle in today’s prices would cost about $150,000 — too much to be commercially viable). Questions such as “What if a machine is hijacked?” highlights the imperative of cyber security of a vehicle’s data. In addition, standards need to be developed. Rao said work is being done here, but for now no-one knows how many sensors need to be built into an autonomous vehicle, or if such things as a camera will be included. And, once we’re passengers in autonomous vehicles, what will we do? Rao’s organization Frost & Sullivan which conducts some 200 studies a year has looked into this. People surveyed said they’d engage in social media, do some office work, watch TV, and have a snack instead of keeping their eyes on the road and their hands on the wheel.